Work is under way on a set of canal lock gates that were so badly damaged by a storm the canal started to empty. 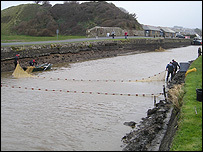 A sandbag dam was built to try and temporarily stem the flow of water from the Bude Canal in Cornwall following storms in March. North Cornwall District Council is now carrying out repairs estimated to cost about £200,000. Part of the work includes dredging the lower canal basin to safeguard access into the harbour for larger vessels. After the storm the Environment Agency came to the rescue of more than 100 fish in the canal. Over the years the canal has become a significant fishery and the team was able to save carp, bream, perch, 60 roach, a sea trout and 10 eels. The damaged lock is one of only two in the UK to open directly onto the sea.